Film series – in 2018 we screened Hidden Figures, La La Land, A Man Called Ove, and more! Membership is an affordable way to support our community! Dues start at $10/year. Memberships and donations are tax deductible to the extent allowed by law. The Friends of the Library welcome your book and DVD donations. Thank you! PLEASE NOTE: Please hold your book and DVD donations during the month of April, 2019. Our storage room is completely full! Thank you for your generous support. Monetary donations are also welcome, and will be used along with membership dues to support Library programming. The Friends have a variety of books available at the Daily Book Sale, located on the main floor of the Library, next to the Reference desk. Our regular Fall and Spring Book Sales are major fundraisers for the Friends. We have new Friends book bags, now available for sale at the Circulation desk in the library for $8.00! 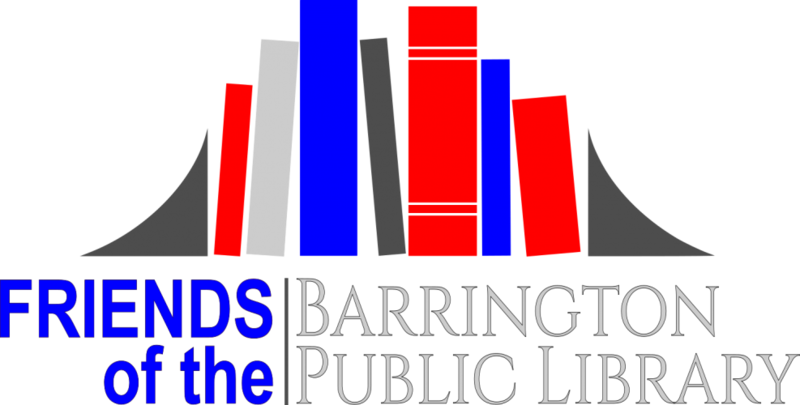 The bag, which is a sturdy canvas, shows off the new Friends of the Barrington Public Library logo, designed by Barrington resident Peter Nilsen, an art director and artist. Peter has published a number of fly fishing books and is president of the Rhody Fly Rodders. Sold at the circulation desk, or order online and have them shipped. The online price includes shipping and handling. Purchase a deck of playing cards and enjoy 54 photographic images of Barrington’s iconic places and scenic views! Sold at the Library’s circulation desk for $10, or order online and have them shipped.